Figure 10.7 Large downtown department stores emerged in the Interwar years as temples to consumerism. 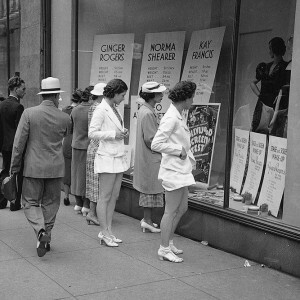 Window shoppers outside Simpson’s in Toronto view styles alongside the sizing details of Hollywood’s first generation of stars (including Canadian Norma Shearer). Magazines were important harbingers of consumerism in the 20th century. Not only did they bring goods for consumption to many through advertisements, but they also brought messages about what Canadians should consume and for what purpose. For women, they advertised products that would allow them to find and keep their husbands, ranging from beauty products to appliances, as well as goods that promised to make them good mothers. For men, they advertised products that would allow them to demonstrate their masculinity. While the advertisements (ads) used slightly different copy and language over the 20th century to reflect broader cultural interests and to suit the shifting norms and values, for the most part, the prescriptions for normal (middle-class, white) women and men can easily be seen. As such, consumerism has been an important framing concept for Canadians throughout the 20th century. And it is a concept that shapes how other groups frame their discussions around different aspects of life in Canada. For instance, the medical profession uses consumer culture to sell their services, whether it is by reinforcing the suitability of products for consumers with their expertise (for instance, “97% of doctors say this product will…”) or by selling their own expertise as a product in and of itself, a phenomenon witnessed especially since the 1980s. Depending on the marketing vehicle, other groups, such as the legal profession or organized religion, can also be seen to use consumerism to promote their positions on Canadian culture. While one could argue that the influence of consumerism is particularly subversive if consumers are not critical in their consumption, there is also evidence to show that Canadians are good at using vehicles like magazines to promote their own interests. In her study of Chatelaine magazine in the 1950s and 1960s, Valerie Korinek demonstrates that women successfully advocated for changes to women’s status in society through both the advertisements and articles in the magazine. It is important to remember, though, that these were, generally speaking, the perspectives of the privileged members of society. Marginalized groups (such as those with different racial, class, or sexuality positions) tend to be overlooked even today. In fact, one might argue that the hegemony of consumerism helps to reinforce existing inequalities. Constructing consumerism involved educating citizens in the business of buying things they didn’t know they needed. 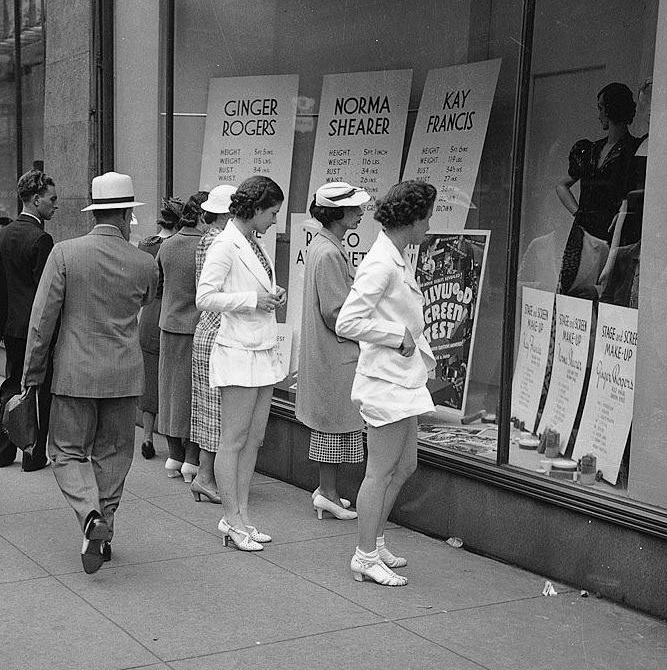 Consumerism became a way of framing the economy and day-to-day life in the 20th century. Magazines in mid-century became vehicles for dissemination of consumerist attitudes and the promotion of group and professional interests. Window shopping at Simpsons 2 by Infrogmation is in the public domain. This image is available from City of Toronto Archives under the archival citation Fonds 1257, Series 1057, Item 4762. 10.4 Consumerism by Tracy Penny Light, Thompson Rivers University is licensed under a Creative Commons Attribution 4.0 International License, except where otherwise noted.